At what point basic facilities become more than basic is subjective and a little difficult to judge, so this page and the associated blog posts chronicle the evolution of our life here to the point where we at least judge our facilities to be comfortable and convenient year round. Buildings, energy and sanitation are described in their own sections. 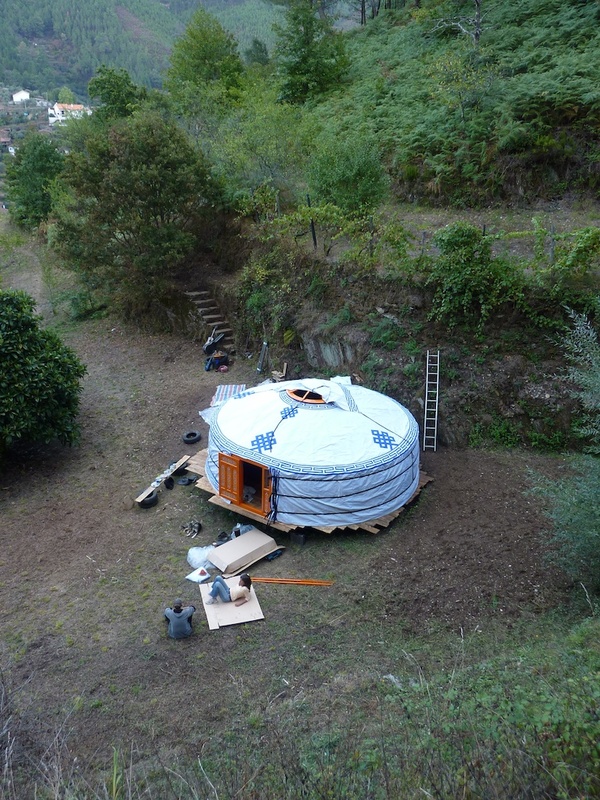 For our temporary accommodation while renovating the buildings on the quinta, we purchased a 5.8m Mongolian yurt or ger. A romantic choice of accommodation, but also utterly practical. 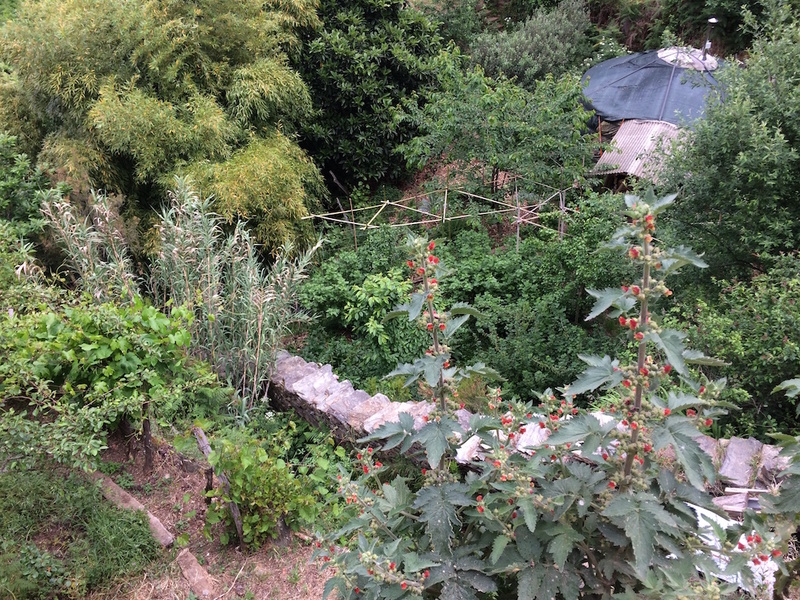 With these steep slopes, there was nowhere we could site a caravan or truck without major excavations and it also felt important to be living in the heart of the quinta, not at the periphery. 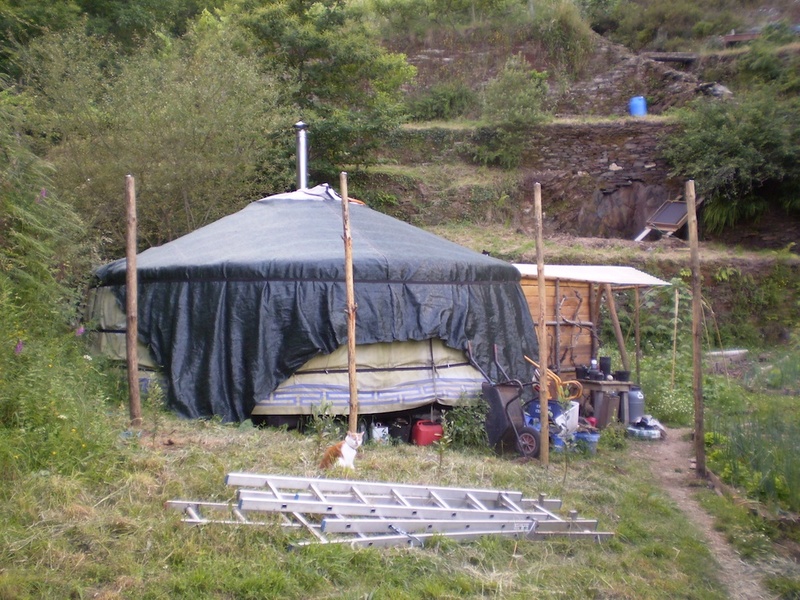 Buying a yurt from Mongolia might be considered extravagant, particularly with the embodied energy in its transportation from Ulaanbaatar to the UK and then to Portugal. But it felt important to me to give something back to a culture which originated them and a way of life that’s dying out under economic duress created by the ubiquitous spread of western values. (See Byambasuren Davaa’s film Cave of the Yellow Dog.) 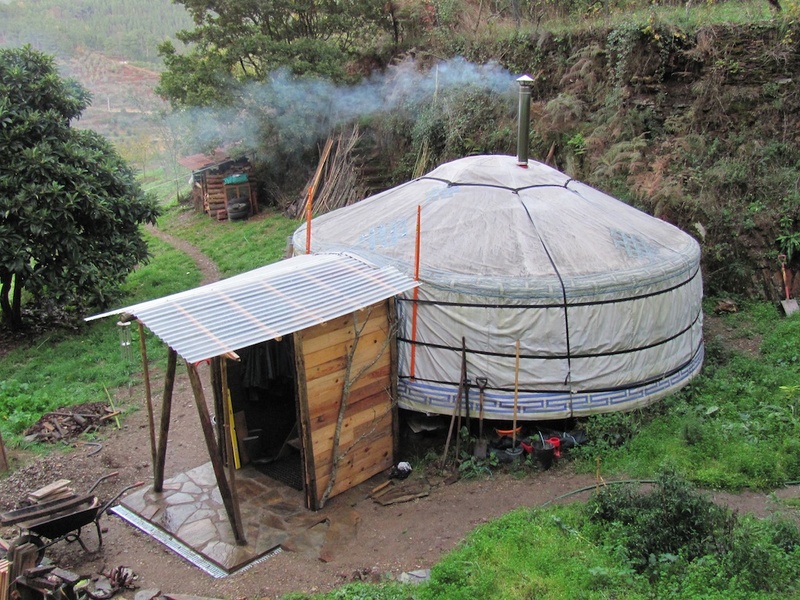 Ulaantaij, the company manufacturing the yurts, have a sound ethical basis, source their wood from sustainable forests, and support social programmes for Mongolian nomads being driven off the steppes. 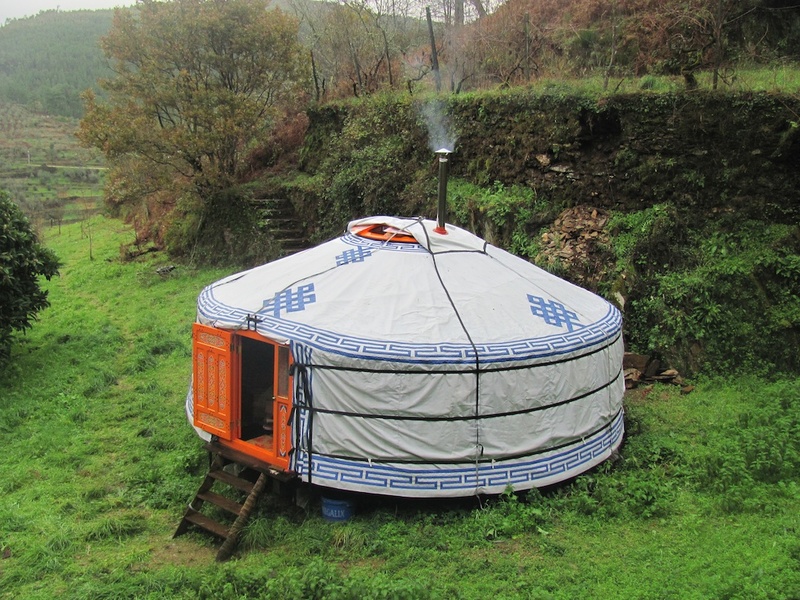 They also make really beautiful and high quality yurts in traditional style. 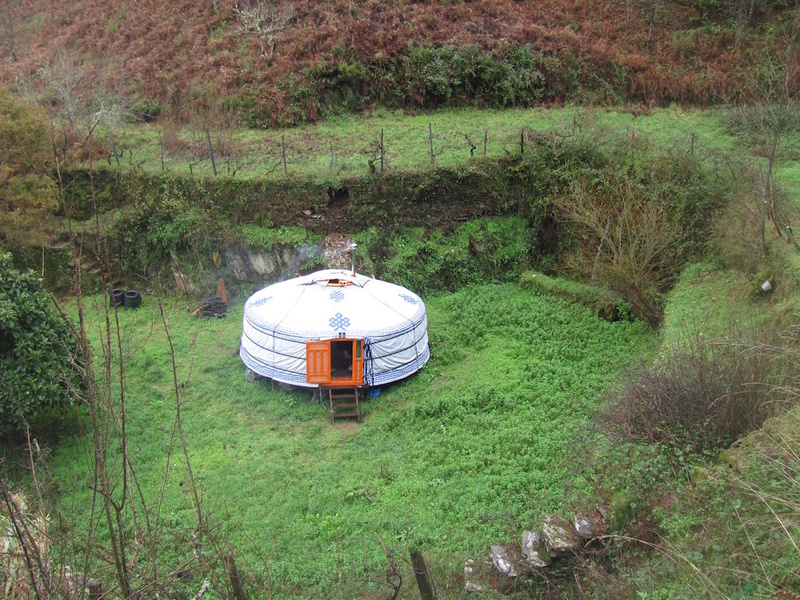 There is really only one place with a ground area large enough for a 5.8m yurt on the quinta, and that’s in the stream valley where the terraces are a bit wider. 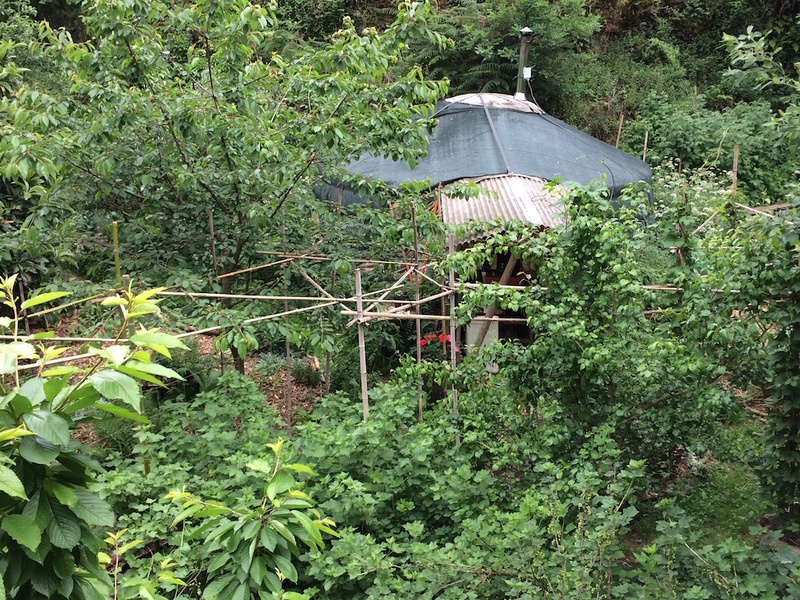 It’s also sheltered from mountain winds, safer in fires and secluded from village view. Sound coming up from the village below isn’t as loud either. 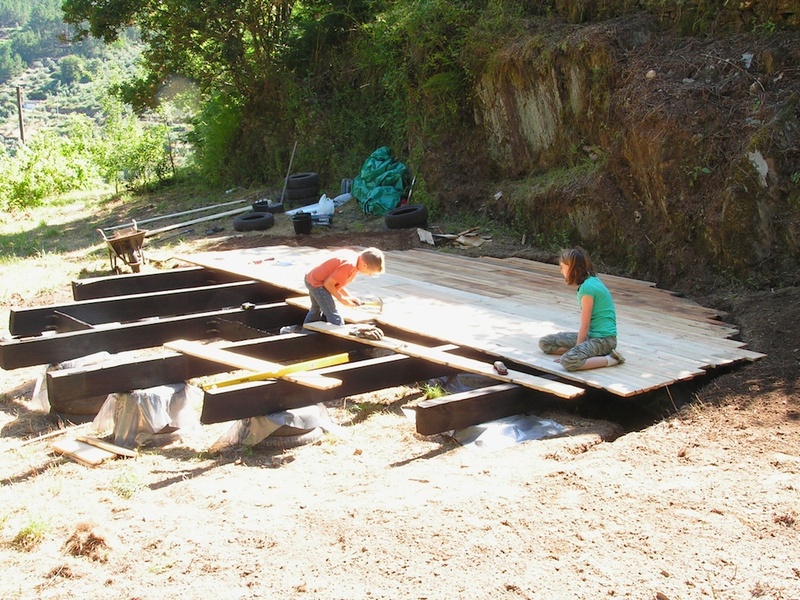 We chose the middle of the three terraces there to build the wooden platfom for the yurt, which was almost completed in 2009 over a 2-week summer visit by me and the two youngest children. 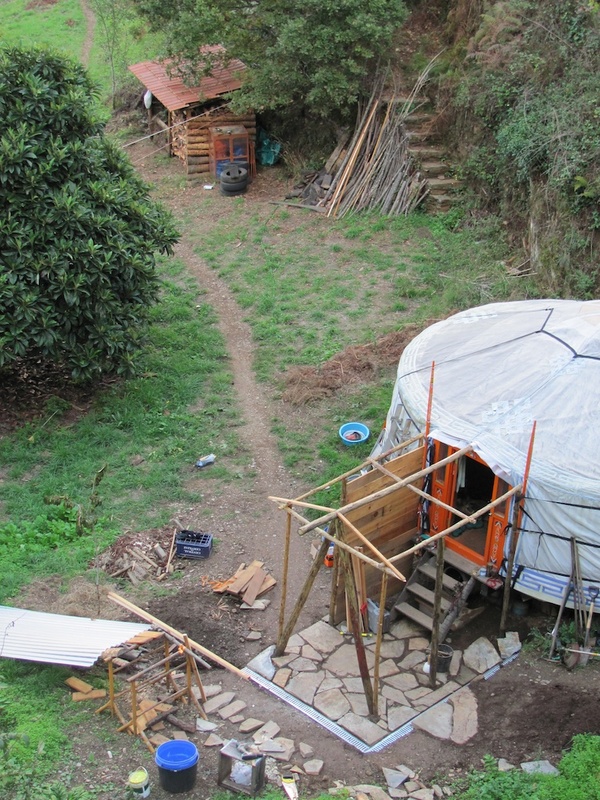 We came back for another 2 weeks in September to finish it and erect the yurt. 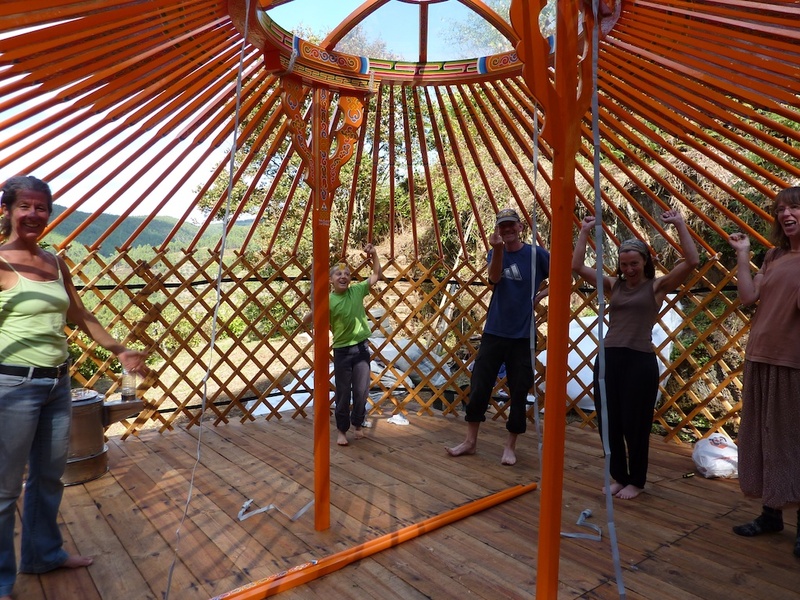 The challenge with the platform is to construct a solid raised area for the yurt to sit securely on while allowing easy drainage of rainwater runoff. 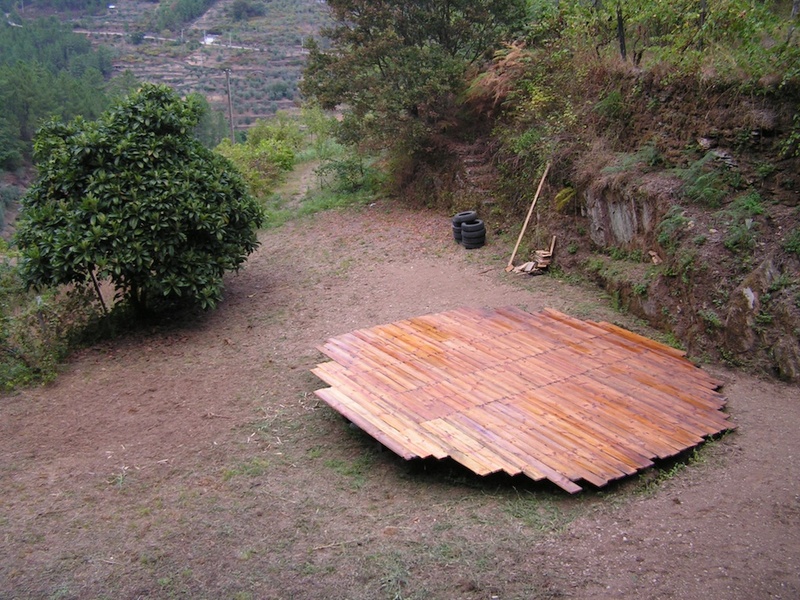 Wooden platforms that extend beyond the circumference of the yurt itself can allow water to pool and lead to damp and mould problems, so we cut the platform to the size of the yurt after it was erected. 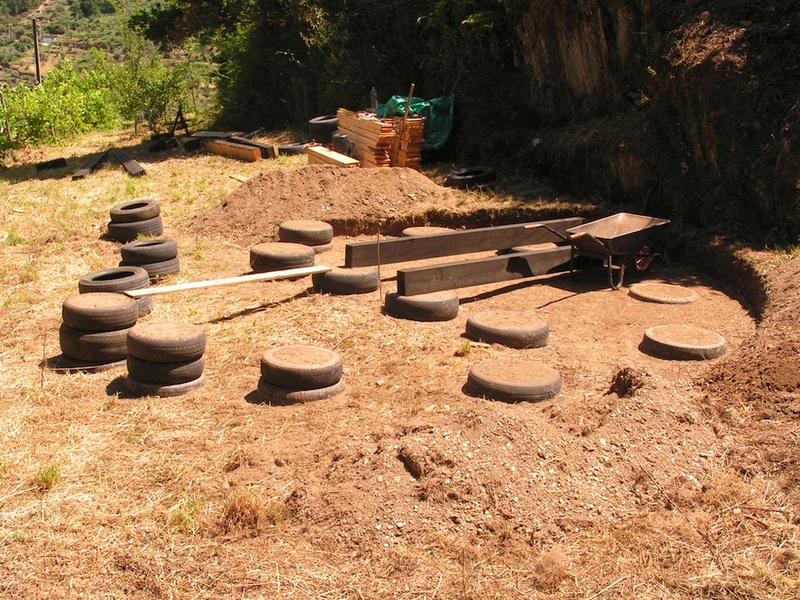 We used old tyres (free from a local garage) filled with rammed earth to make the pillars for the platform and preserved the joists and underside of the floor timbers with used engine oil. 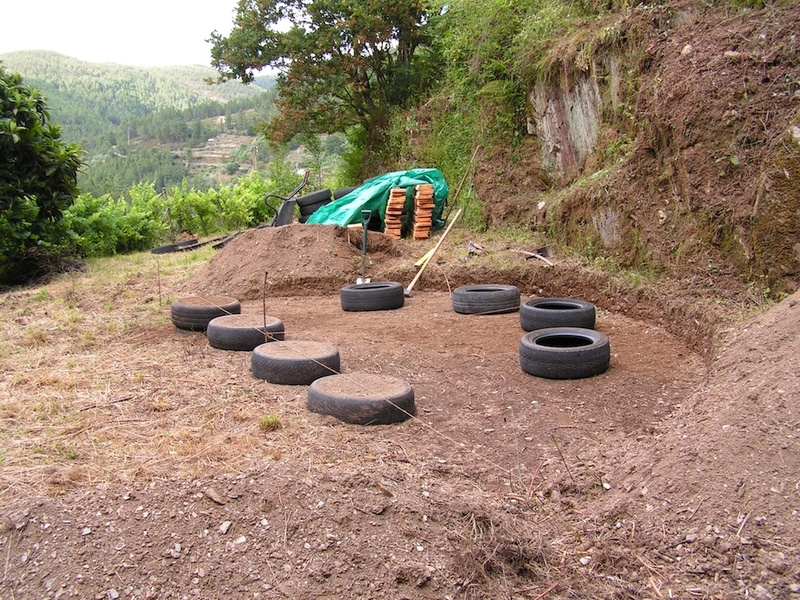 Not only does this seem to be one of the most effective and economical treatments for preventing insects attacking the wood (which can be a big problem in Portugal), they don’t appear to be interested in setting up home anywhere near it either. The upper surface of the platform is preserved with linseed oil. To prevent wind and rain driving underneath the covers at platform level, we tacked a skirt of plastic about 1m wide around the circumference of the platform, and folded this up between the felt and inner canvas layers. Although this does reduce the breathability of the walls, we’ve experienced no problem with it. 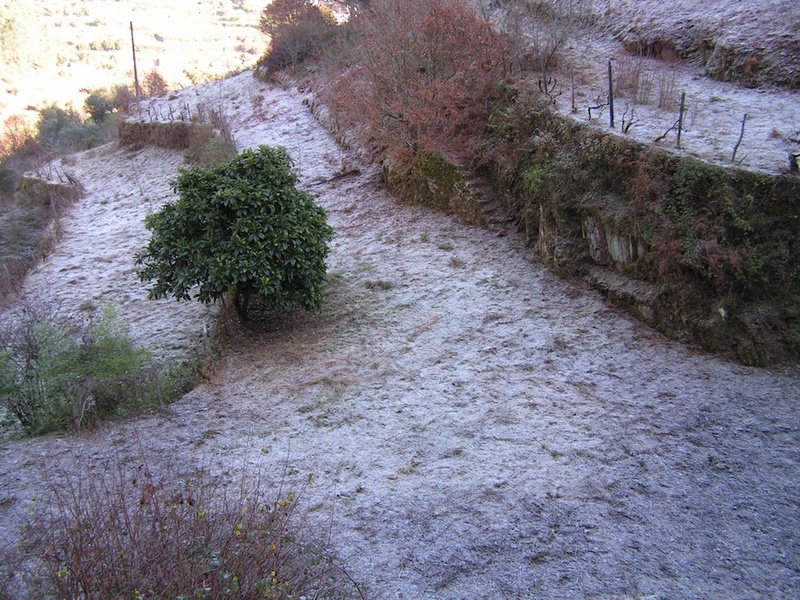 This proved to be a wise decision given the enormous amount of rain which fell in Portugal in the winter months of late 2009 – early 2010. 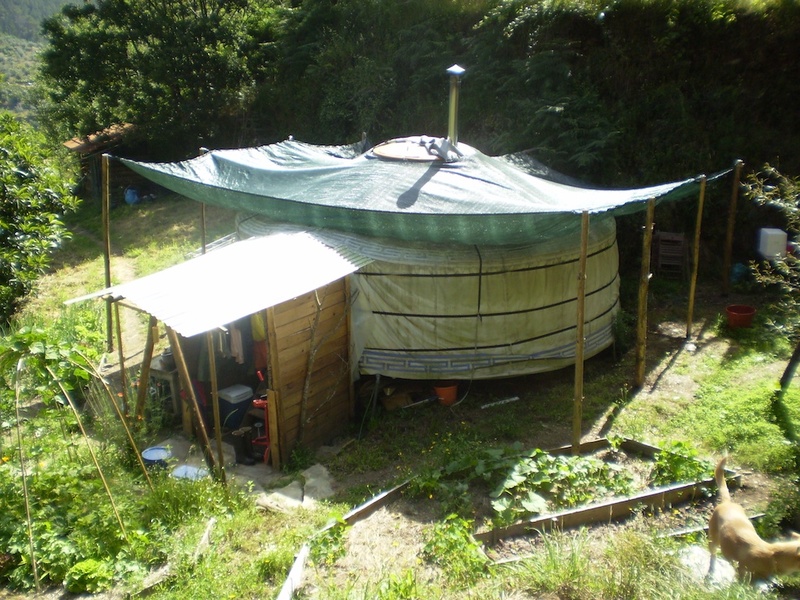 The only solution in such situations is to make sure the yurt is constantly inhabited and a stove kept running to dry it out as fast as it gets wet. We also had problems with the door and door frames swelling. For the following winter we built a porch to protect the entrance and have had no problems with the doors since. 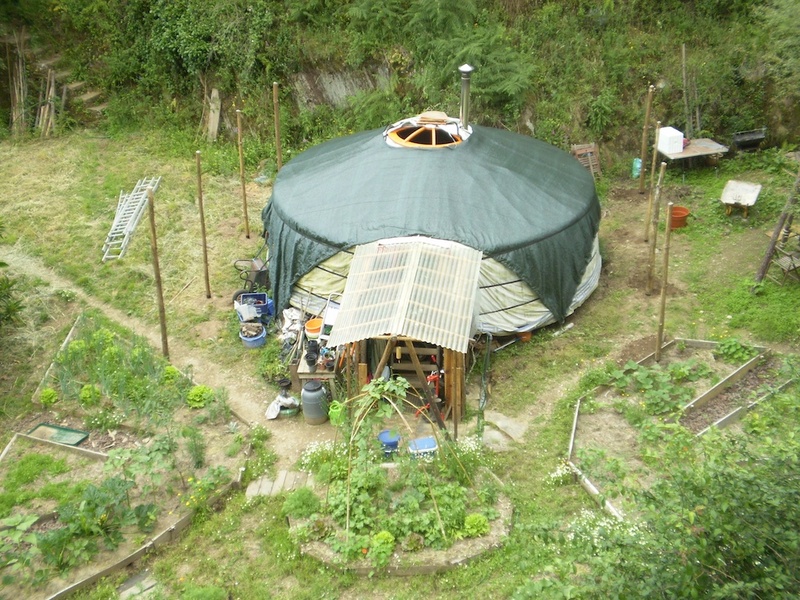 The following year, we covered the yurt with shade netting. Perhaps surprisingly – at least to someone coming from Northern Europe – it’s not so much the rain that causes problems for the canvas covers as the sun. The strength of the Portuguese sun in summer causes the canvas to rot and covers can last no longer than 2-3 years if not protected. The shading has preserved the canvas very well, but the straps rotted out. 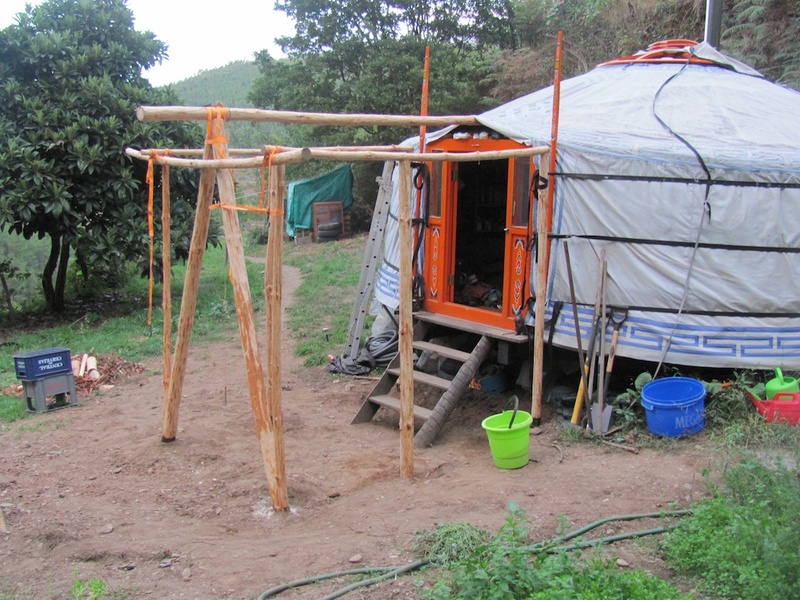 I replaced them with 5-tonne polypropylene ratchet straps, which also have the benefit of being able to strap the yurt and its covers securely down onto the platform. This has proved invaluable. Winds in mountain valleys can be fickle and we had a number of occasions in the early years when a gust succeeded in ripping the covers off, usually in the middle of the night in a gale. 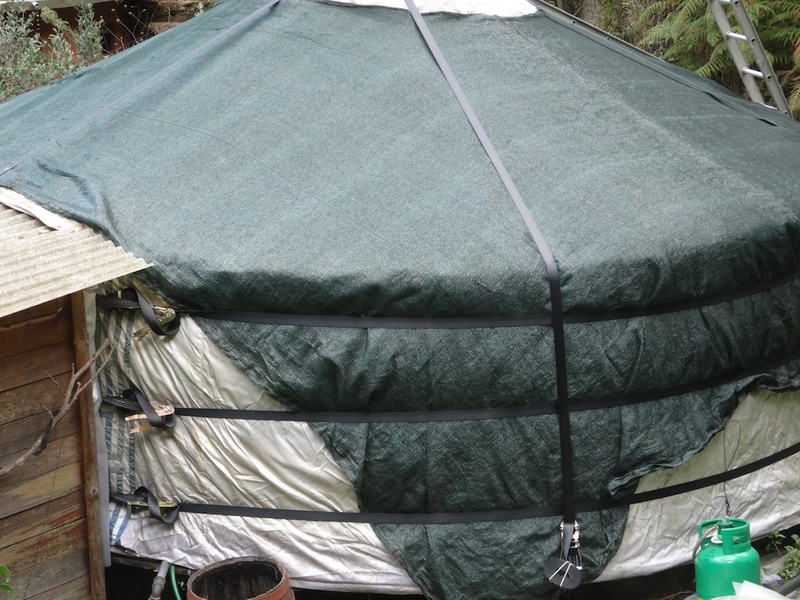 The yurt survived the fires of October 2017. I had given it a thorough soaking before we had to leave the quinta, and set a sprinkler going on top of it. The water supply pipes burned out, but the sprinkler kept going long enough to mean the yurt was completely untouched by the fire, even though it came to within 20cm of the back of it. Now, 9 years on, it’s still part of my ‘home’ and until the vision for the buildings here has been realised, will continue to be so. 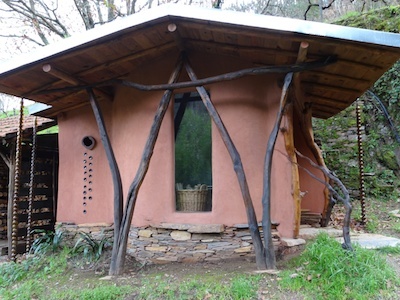 Extended accommodation – for me and also for guests and volunteers – with space to cook and entertain was added in 2013 with the partial completion of the wee house. When the fires came in 2017, the building was within just weeks of full completion. In 2016 we excavated two parking spots on the trackside and added 2 caravans for volunteers. The October 2017 fires gutted the wee house and completely destroyed one of the caravans. The wee house burned because there was a log store too close to the building. The pallets under the firewood acted as kindling and the firewood caught light. Forest fires are generally fast-moving, but this allowed the fire to stay in one place long enough to ignite the rafters in the open kitchen behind the building and the wooden roof structure took the fire into the building itself. It was completely gutted, but the earthen plasters on the interior walls protected the stonework from fracturing in the heat, so it’s possible we can rebuild. One caravan survived, but with its plastic windows melted, it’s was no longer waterproof. Finding replacement windows proved difficult, so eventually we replaced them front and back with solid pieces of acrylic and a side window sourced from another caravan. Initially we used our camping-style kitchen facilities in the yurt but needed a better solution for accommodating volunteers, guests and visitors and for more varied meals. An outside kitchen was created behind the wee house in 2013. 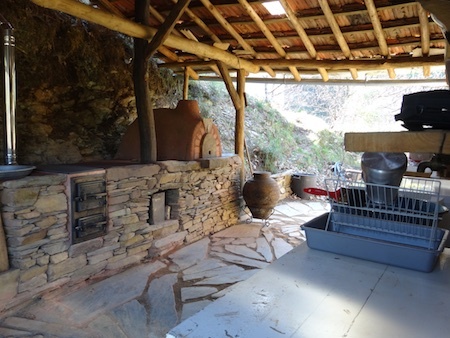 This was the main summer kitchen for me and for volunteers and visitors, featuring a cob oven, wood-fired stove and parabolic reflector solar cooker. It burned out along with the wee house in the October 2017 fires. We plan to rebuild, resources permitting. Another kitchen is planned for the main building which will eventually become the communal hub of the quinta. Amazingly, the parabolic reflector solar cooker survived, though it got blown off a terrace in the March storms and damaged beyond use. It’s now in for repair. At the beginning of 2010, we were aiming to have a solar-heated shower and washing area up and running as soon as practicable. When Chris and Emma, and then Chris’s brother Michael, decided to come and join us for most of 2010, all of that took a back seat. With our ‘volunteers’ renting accommodation down in the village (including shower and washing machine), the pressure was off to provide these facilities at the quinta. With their return to Scotland at the beginning of 2011, we had to get back on the case again. 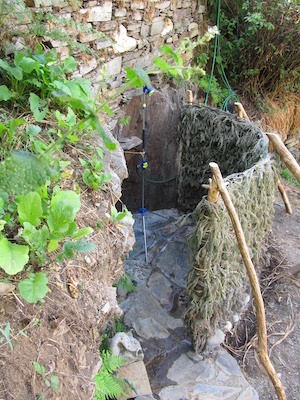 In January we managed to divert an old washing machine from the village on its way to the rubbish tip. It was fine for a temporary solution but the amount of electricity and water the monster consumed meant we needed to find a better solution by the time winter came around again. Several of us living off-grid locally got together and made a bulk purchase of some twin-tub washing machines. This is much more economical to run and very much more flexible than an automatic in how we use it which suits us fine. 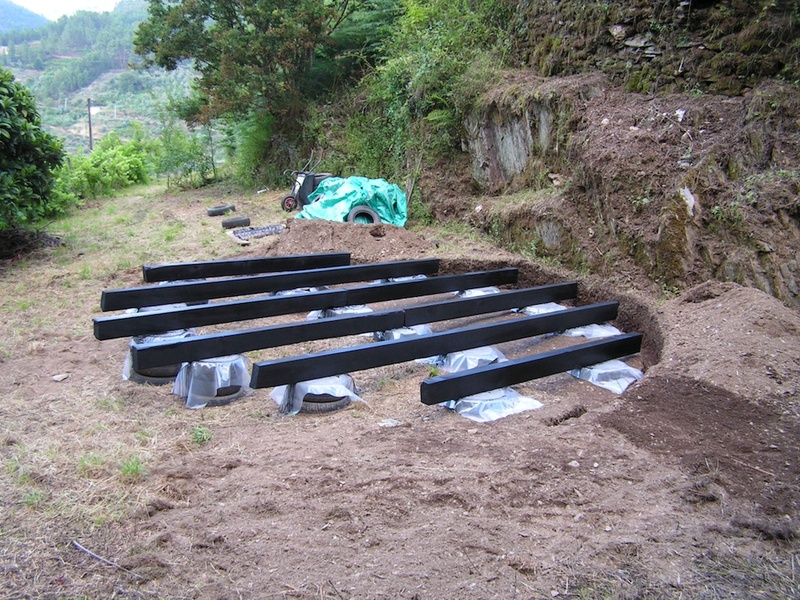 Work on creating an outside solar shower began at the end of May 2011 and this saw us through 2 summers. 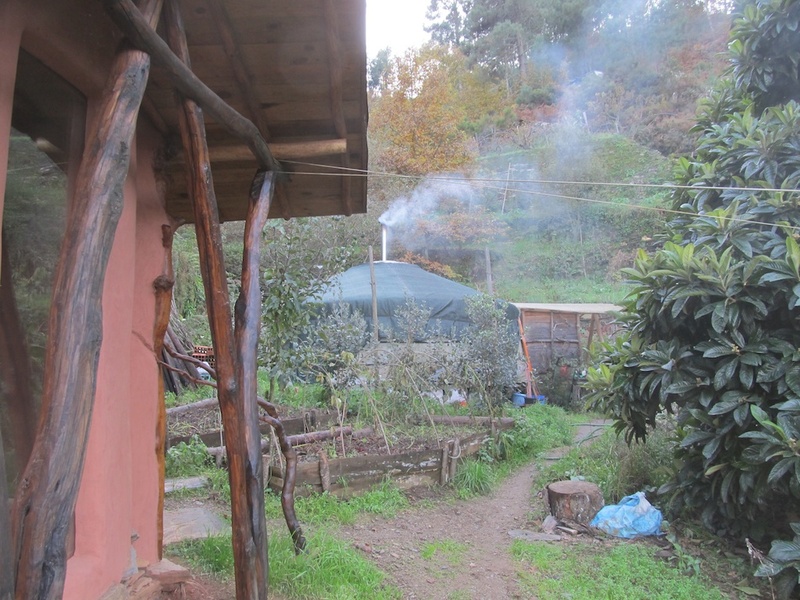 At the end of June 2012, we started construction on a cob bathroom to give us year-round facilities with a wood-fired water heater for winter and a solar collector for summer. 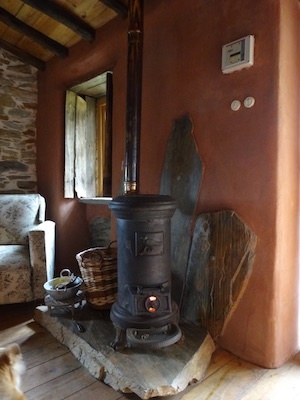 We started using this even before the walls were built and, after allowing the cob to thoroughly dry out following a very wet winter, completed plastering and floor-laying in summer 2013. The cob bathroom was damaged in the fires of October 2017, thanks to another log store next to it catching fire. A good lesson learned about not building log stores too close to buildings … The cob stopped the fire dead at the walls so the bathroom remains useable. We need to replace part of one side of the roof, partially dismantle a wall to do so, and replace the front window which broke in the heat. Repairs should be complete by the end of 2018. 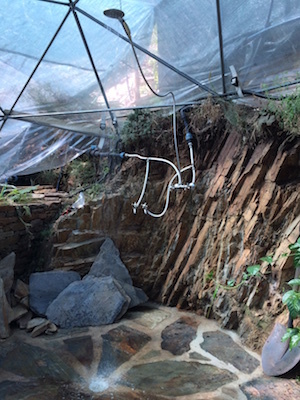 In 2017, we started creating another bathroom in the geodesic dome greenhouse and the shower was plumbed in and working, even if the surroundings weren’t yet finished, when the fires hit in October. The plumbing is now mostly burnt out, but when we manage to raise funds to repair the greenhouse, the bathroom there will be finished.